A little over a year ago I made strawberry cheesecake bars for a graduation party. Apparently they were memorable as I have had requests to make them again and to divulge the recipe. I’ve noticed it doesn’t count if I rattle off the recipe from memory or say, “it’s easy, you just make basic cheesecake bars and then add some jam and spread it around.” No. The people want the recipe. They want to see it. My problem with recipes is that I almost always alter something…or I try something to make it better. The recipe I was working from really is just a basic recipe but it called for a nut crust. I don’t make nut crusts (my people would not want to eat nut crust). I made graham cracker crust instead. Note to people making this: if you have time let your crust cool before you top with filling and bake. I think doing this will result in a firmer crust. The original recipe called for making the filling without the jam and serving with fruit. I decided I would just use my strawberry freezer jam and spread it with a knife in a way that was pleasing to the eye. Then the bars already have fruit. Just recently when I made these bars I started around one in the afternoon and had to have them done by around three for a barbecue. Lucky for me we decided to be fashionably late so I got to leave them in the freezer for about 45 minutes before cutting the bars. In order to get them to lie flat in my chest freezer I had to move items around to make a flat space and try not to let a giant ice cream cake slide out of its container. They were able to rest on top of the ice cream cake and one small package of ribs. I also held my breath when closing the lid. After cutting the bars and placing in a container with a lid I placed them in the beer cooler and waited several hours before serving. I think they are excellent chilled. This recipe is adapted from a basic cheesecake bar recipe found on allrecipes. To make filling beat together cream cheese and sugar until smooth. Then mix in lemon juice, milk, egg and vanilla. Pour on top of cooled crust (or slightly cooled crust). Spread out evenly. Evenly space the heaping spoonfuls of strawberry jam (9 or so) then spread out with a knife so it looks good. Bake for 25 to 30 minutes then let cool on wire rack. Start checking after 20 minutes. To speed cooling place in freezer. (Like if you are in a hurry and have to make it to a barbecue.) Cut up and enjoy. 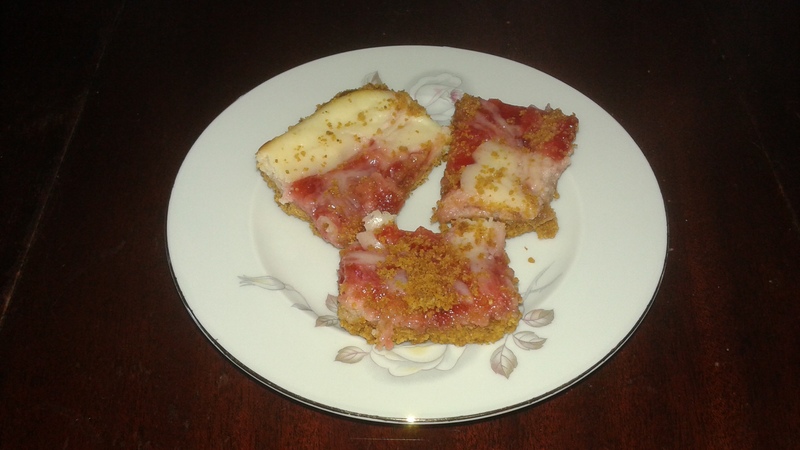 This entry was posted in food and recipes and tagged baking, blog, cheesecake, cooking, cream cheese, dessert bars, graham cracker crust, recipe, strawberry cheesecake bars, strawberry jam. Bookmark the permalink.